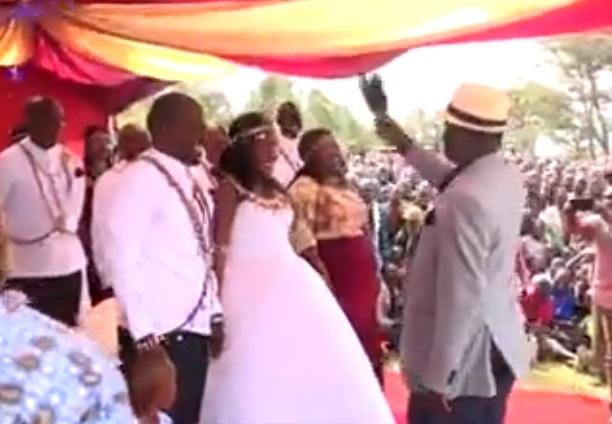 Home / Entertainment News, Featured Articles, Gossip and Drama, Videos / See what RAILA was doing to these newlyweds with his fly whisk that some link with “Juju” (VIDEO). See what RAILA was doing to these newlyweds with his fly whisk that some link with “Juju” (VIDEO). Tuesday, August 28, 2018 - Former Prime Minister, Raila Odinga, has a fly whisk which he carries any time he is going to a social function. Some people have been linking Raila’s controversial fly whisk with witchcraft but “Baba” is never concerned with what people say. Check out what he was doing to these newlyweds with his famous fly whisk. Perhaps he was blessing them.